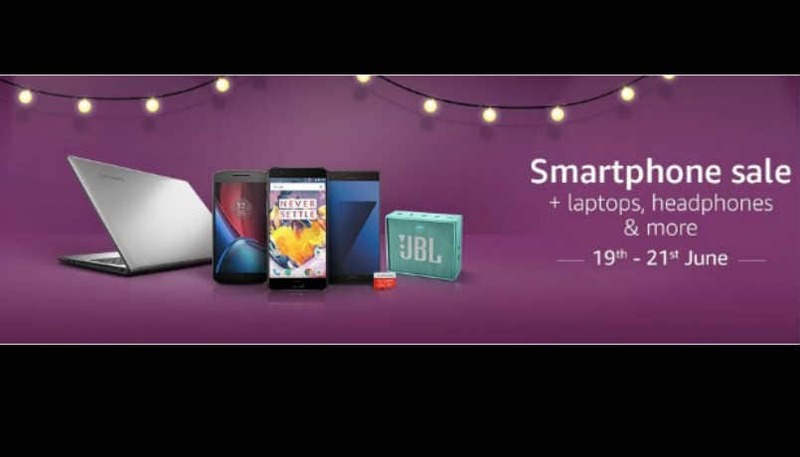 Amazon India smartphone sale: Offers on Apple iPhone SE, Samsung Galaxy On8, Moto Z..
General News: Amazon India smartphone sale: Offers on Apple iPhone SE, Samsung Galaxy On8, Moto Z..
General News Amazon India smartphone sale: Offers on Apple iPhone SE, Samsung Galaxy On8, Moto Z..
Before the month of July kicks in and GST comes into effect, e-commerce websites like Amazon India and Flipkart are holding massive sales to clear inventories sourced from states with lower tax than the proposed 12 percent GST. Essentially, once GST kicks in, tax differential between states will no longer work. And therefore, along with Flipkart, Amazon India is holding a number of sales on merchandise, home appliances, and smartphones. The smartphone sale begins today, that is June 19, and will go on till June 21. Under this sale, Amazon India is offering a bunch of deals that range from low to high-end smartphones. Other than some pretty attractive discounts, there are also exchange offers, where you can trade your older smartphone for the new one, to get an additional discount worth your old device. Additionally, before we move on to discussing the discounts, Amazon India also has an offer on new Prime memberships. According to the offer, on joining the Amazon Prime right now, members will get a cashback of 20 percent on adding Amazon Pay balance. Back to the discounts on smartphones, here’s taking a look at some of the best deals in each category. In this ultra-budget category, there are some pretty interesting discounts going up to 50 percent. For instance, the Coolpad Note 5 Lite with 3GB of RAM and 16GB onboard storage is available at a 22 percent discount, bringing the price down to Rs 6,999. Additionally you can save another Rs 1,000 by exchanging an older device. The Samsung On5 Pro Gold variant is now discounted by Rs 800 — down from Rs 7,990 to Rs 7,190. Further, the Moto G4 Play, is also on offer with a discount of Rs 1,500 that brings the price tag down to Rs 7,499. However, the heftiest discount we see in this category is on Intex Aqua Supreme+ with a discount of 53 percent. This brings its price down from Rs 11,900 to Rs 5,499. Moving to the budget category, smartphones like Samsung On7 Pro, Moto G4 Plus, Honor 6x and Coolpad Cool 1 among others are under discount. The Samsung On7 Pro Gold and Black variant is available with a Rs 800 discount, bringing the price down from Rs 9,490 to Rs 8,690. The Moto G Plus 16GB variant is retailing at 22 percent lower — down from Rs 13,499 to Rs 10,499. The 32GB variant of Moto G Plus, on the other hand, is now retailing at Rs 13,699 from Rs 15,999 earlier. The Honor 6X, which was launched earlier this year is also up for a discount. The 32GB variant, is now down from Rs 12,999 to Rs 10,999. The 64GB variant of the same is now available at Rs 13,999, down from Rs 15,999. The Coolpad Cool 1 4GB variant, too gets a 20 percent discount. From Rs 14,999 earlier, the smartphone is now available at Rs 11,999. The discounts available on the mid-range smartphones are the most exciting. For instance, Apple iPhone SE 16GB variant is available at Rs 19,999. The 32GB variant is available at Rs 23,388, down from Rs 27,200. The 64GB variant remains undiscounted. While on most other smartphone the exchange offers weren’t all that great, the iPhone SE has an interesting deal, where you can get an additional discount of up to Rs 13,060. The Samsung Galaxy On8 Gold variant is also on discount. Down from Rs 13,490, the smartphone is now available at Rs 12,490. The Apple iPhone 6 32Gb variant is also available under this offer, and is now priced at Rs 24,999, down from Rs 30,700. The Gionee A1 is also discounted by 22 percent, which is now available at Rs 16,750. In the premium segment, the most attractive discounts are on the Apple iPhone 7, the iPhone 7 Plus, the Samsung Galaxy C7 Pro, and the Moto Z. Under the sale, the Apple iPhone 7 32GB black variant is being sold at Rs 42,999, down from Rs 60,000. The 128GB variant of the iPhone 7 is available at Rs 53,831, down from Rs 70,000, and the 256GB black variant is available at Rs 69,180, down from Rs 80,000, and the gold variants in 256GB is available at Rs 65,900. The Samsung Galaxy C7 Pro is also on offer, discounted by Rs 4,000, and is now available at Rs 25,990. Also the Motorola Moto Z, which comes with a Style Mod, is discounted by a good Rs 10,000. Down from Rs 39,999, the smartphone is now available at Rs 29,999. Additionally, if you scroll down on the Moto Z listing, there is a list of special offers on JBL Soundboost, Hasselblad True Zoom Camera, Insta-Share Projector, and other Mods. The three-day smartphone sale on Amazon India draws to a close today, and you still have a good chance to make the decision and upgrade. Under the Amazon Smartphone Sale, there are a range of offers, and discounts available on smartphones across price categories. Here are some major discounts on noteworthy smartphones to help ease your last minute purchase. If you have been long considering a switch to an Apple iPhone, now is the time. The iPhone 7 (32GB) is available at Rs 42,999, following a flat discount of Rs 17,001. There is also an exchange offer which can get you up to Rs 13,070 off. The highest model with 256GB storage is available at Rs 64,800 in Jet Black variant. However, the exchange offer is the same with up to Rs 13,070 off. The iPhone 7 Plus is available at Rs 56,999 for 32GB model, and with exchange you can get up to Rs 13,070 off. The highest variant with 256GB is available at Rs 81,999 after a Rs 10,001 discount. As for the OnePlus 3T, there is no discount in terms of price, but you can buy it at a lower price with exchange. It is priced at Rs 29,999, and there is an exchange offer of up to Rs 13,070 off on purchase. Other offers include Rs 500 Kindle ebook promotion credits. Samsung Galaxy C7 Pro is available at Rs 25,990 after a Rs 4,000 discount. You can also avail discount of up to Rs 13,070 if you exchange an older smartphone. In addition, you can get up to Rs 2,000 as Amazon Pay balance if you purchase the smartphone through credit card EMI from select banks and the seller. If you are looking at upgrading to the Moto Z, there is a major discount on the modular smartphone. It is available at Rs 29,990 following a Rs 5,000 discount. In addition to that, you will be eligible for discounts up to Rs 5,000 on the Moto Mods, if you make the purchase through Amazing Mobiles. Moto G4 Plus (16GB) is available at Rs 10,499 after a Rs 3,000 discount. You can further avail the exchange offer where you can get up to Rs 8,180 off on the purchase of the smartphone. There is a Vodafone Special offer where you will be eligible for 45GB data free for 5 months. Honor 6X, which is one of the few affordable smartphones with dual camera module, is available at just Rs 13,999 for the 64GB model after discount. There is also an exchange offer of up to Rs 11,080 on the smartphone. Samsung Galaxy On8 is available at Rs 12,490, and you can avail further discount by exchanging an older smartphone for up to Rs 9,555 off. 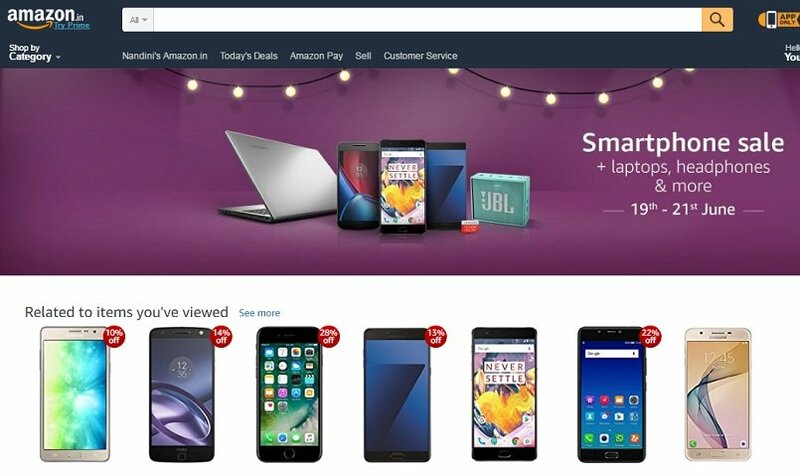 If you want to make the most of the Amazon Smartphone Sale, you ought to check the heavy discounts on the budget smartphones. In the sub-Rs 10,000 category, you can purchase the Samsung Galaxy On7 Pro which is available at Rs 8,690 along with an exchange offer of up to Rs 6,660. You can also avail the Vodafone Special Offer with the purchase of this smartphone. Moto G4 Play, which has been a popular Moto device, is available at Rs 7,999 along with special offers such as discount on Kindle eBooks and Vodafone Special Offer. You can also exchange it for an older smartphone and get up to Rs 6,300 off. Coolpad Note 5 Lite is available at Rs 6,999. There is an exchange offer that can fetch you up to Rs 5,552 off. The smartphone further has special offers from both Idea Cellular and Vodafone. Current time: 04-22-2019, 11:39 PM Powered By MyBB, © 2002-2019 MyBB Group.